The OSC Tropical Paradise was held August 26 at Vesper Hills Golf Club. How did we pick a perfect day, at a wonderful venue? The music was a great blend of tunes by the Mix Tapes; the food scrumptious; golfing was a little crazy, but hey, we had 52 golfers complete 9 holes and still be in for Happy Hour! And Miss Tropical Paradise 2018 is Marian Jerose - her prize will really enhance the rest of her summer! Special thanks to the OSC TP team who were key in making this a fun event: Mary Clements, Terry Clark, Sue Shoppiro, Linda Kelly and husbands; Rescuers: Karen Karoglanian, Lynn Weigand, Bruce Kaiser - KUDOS!! 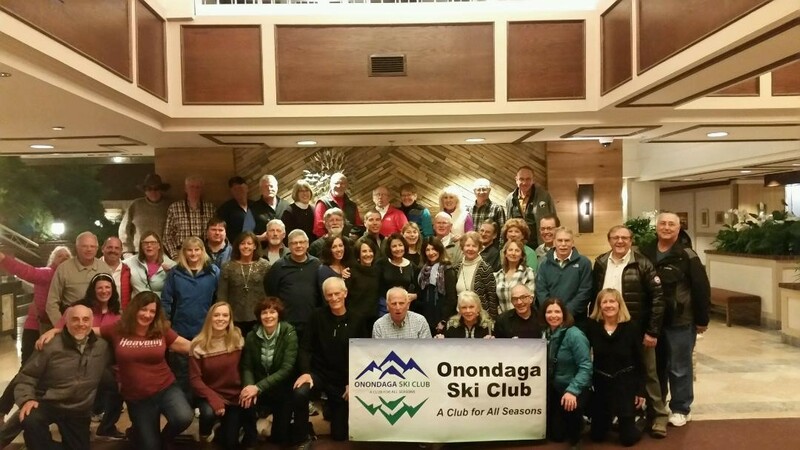 If you have any feedback/ideas that will help future OSC events, please share them with us: mthigh.us@gmail.com Thanks to all who came out to support this OSC event and CONGRATS to all the raffle winners!! On Saturday, August 4, twelve individuals met to play tennis at Sedgwick Farm Tennis Club in the First Annual OSC Round Robin Doubles Mixer. The organizers, Jay Cohen and Juliann Haarman, planned a fun event for the players and those that came to enjoy dinner and watch the matches. Needless to say, it was a very hot and humid afternoon, but the players soldiered on. It was a round robin format where everyone got to play with each other, scores were tallied and winners were announced. After tennis, everyone enjoyed dinner with pizza and various dishes brought by players. (Not only can we play tennis, we can cook, too)! The group also celebrated a special occasion – Past President John’s birthday. Prizes were awarded to those that won the most games - Diane Clark, Steve Tauber, Barb Crane and Don Cronin. In addition, each player received a can of tennis balls for participating. Jay and Juliann want to thank everyone for coming out and supporting the event. Thanks go to Sam Corso, Director of Tennis at Sedgwick, for welcoming our group and letting us use the courts to play. It looked like a great time and maybe next time I’ll have to give it a try. To view photos of the game, visit our OSC photo gallery. We had all been patiently awaiting this trip to Heavenly. Meeting bright and early at 4 a.m. at Hancock Airport in anticipation of skiing in California between three mountains – Heavenly, Northstar and Kirkwood. This was a great group of participants who were looking for fun, excitement and adventure! Air travel was great on the way out, we had lunch on the bus and a 2 ½ hr bus ride to our destination – South Lake Tahoe. Our hotel was a couple of blocks to the gondola that took us up to the base of the mountain. All around our hotel were casinos, restaurants, shops and Lake Tahoe was a few short blocks away. How many ski trips can you also walk on the beach too? We saw motorcycles, convertibles and some in our group even took a bike ride mid-week. We were expecting to see a bit more snow on the ground. We heard stories about the overabundance of snow that they received just a year ago. Heavenly is the mountain where you can ski between two states - Nevada and California. The trails were great and some on the trip enjoyed skiing the trees and chutes. We were given an Epic Mix Pass to use at each of these three mountains. You register your EpicMix pass which records your vertical feet, lift rides and days on the mountain for the day when you pass thru at each of the lifts and it was emailed to you at the end of each day. Tuesday was our trip to Northstar – what a fantastic mountain that was to be at. My thought is ski as many mountains that are offered on a trip, you might miss a great experience otherwise! Where else could you have a champagne Tōst at 2pm on the mountain --- this mountain! First time for everything. The group met on Tuesday evening at the Lucky Beaver for dinner. They did a nice job of accommodating our group and I think everyone had a good time catching up on stories so far on the trip. Wednesday seemed to be a day off for most folks that chose to either take that walk to the beach, hike up the mountain to see a waterfall or a bike ride around South Lake Tahoe. Either way, the views were just breathtaking. Thursday was off to Kirkwood Mountain with a full bus. We were given a map to help navigate some of the lifts and trails since most heard this was a difficult mountain. The map gave you an opportunity to see how the trails were laid out and gave you an opportunity to see what you liked best. Moral of that story – don’t be intimidated by a mountain they usually have something for everyone. Thursday night was our group dinner at the Hard Rock Café inside Harvey’s Casino. I’m so glad that Steve and I decided to scout that out prior to that evening as it was deep inside the casino. We decided to have everyone gather for a group photo at the hotel first and then all proceed across the street and make our way together. Dinner was a huge success; the servers did a great job from start to finish – kudos to them! Friday was our last day of skiing and our cleanup/out party at Steve’s room – and just outside from it. Pizza, and salad were served. This was also the time to recognize some special skiers in our group – Steve awarded trophies for most vertical, biggest yard sale, party animal and fastest skier (73.56 mph wow). And we also celebrated a few birthdays too! Saturday was our return day, everything was going smoothly until after we all checked in at the airport. From the time we got checked in and up to the gates, our departure time had changed by 2 hours and then a few more. Delta Airlines came through. When the delay reached four hours they brought in pizza, snacks and soft drinks. When they could no longer hold our connection in Atlanta they arranged a special flight for us from Atlanta to Syracuse. We all made it home safely and that was the most important part – Everyone in the group was great taking things in stride the best we could. Quickly find out what Forums are available and which ones have Recent postings on the Forums Summary web page. To access it, click 'Forums' from the main menu. Once you click it, you will see a list of all OSC forums. Scroll down to see recent posts and the forum they have been posted to. Have you subscribed to a Forum? 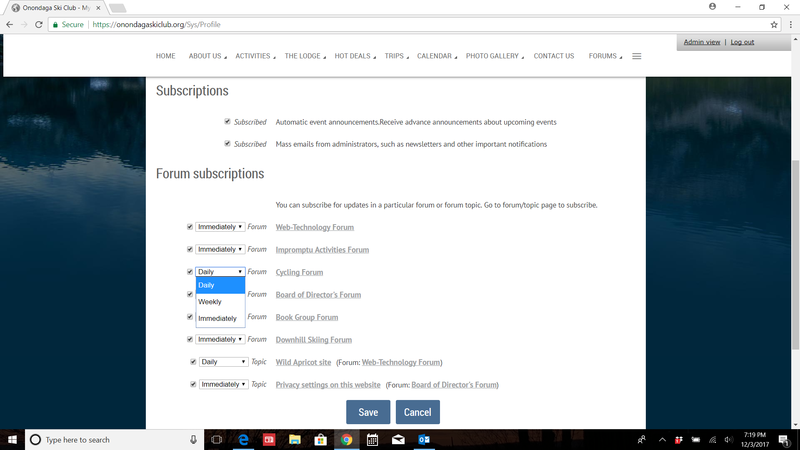 If you have and would like to receive regular email updates from the Forum, you can go to your Profile (click your Name in the upper right hand corner of the web page after logging on) and select the settings you'd prefer. Once you are in your Profile, click Email subscriptions. 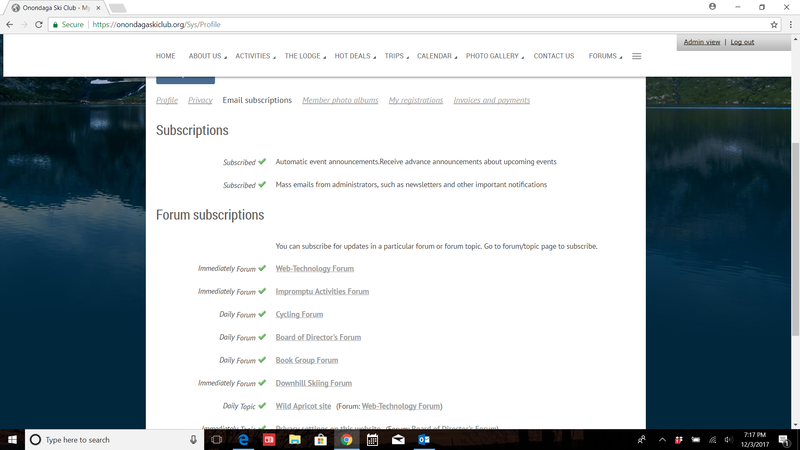 A screen will appear to tell you what forums or groups you are subscribed to as well as the emails you have chosen to see. Click on images below to see larger view. Once you click 'Edit', you will be able to set how frequently you want to receive Email from the Forums. The choices are Immediately, Daily or Weekly. If you select Immediately, you will receive an email within an hour after the Post is made to the Forum. Daily means you will receive it the next day and Weekly is once a week. You can also choose to not receive emails and simply monitor the Forums as you choose. Once you make your selection, be sure to hit 'Save' at the bottom of the page. The website theme that has been chosen for the website is mobile friendly. To log on, click the arrow on the top right of the Home Page and a screen will appear to log on with your email address and password. See example below. Having trouble finding something on the website? If you can't find what you're looking for on the website, use the Search function at the top of each web page; type in a keyword and you will get a list of where the item is listed. You can also click on the three bars to the far right of the menu and then click 'Site Search' to find the layout of the website and a specific web page. Once you find it, click it and you will be taken directly to that page. Lost or misplaced your membership card? There is a new feature on the website - you now have access to a printable copy of your membership card in your profile. This will provide everyone with a replacement membership card should they need one over the course of their membership term. Just access your profile, click 'Printable PDF', print and cut out your card. You can also access from your smartphone. If you've lost your card and need one with the New Jersey Ski & Snowboard Council sticker, you will have to contact our membership registrar. Each members profile is based on the information entered on the application form. If there are changes to this information, a member can logon with their email and password and update their profile. Once logged on, click your name in the upper right hand corner of the screen. If using a smartphone, click on the icon that looks like a person in the upper right hand corner. Once you access the information, click 'Edit Profile'. Make changes to any field that needs updating. Once complete, click 'Save' at the bottom of the page. Note: County has been added as a field in the database. Please enter your county of residence before leaving this page. Note: Before you change your privacy settings, you must go in your profile, click 'edit profile' and add your 'County' of residence to your information. Depending on who you want to view your personal information, you can change privacy settings in your member profile. Click your name in the upper right hand corner of the page. Click the Edit profile button to enter edit mode. You can now choose who can view your personal information. If a lock icon appears beside a field, you cannot change the privacy setting for that field. Once finished changing your privacy settings, click the Save button.